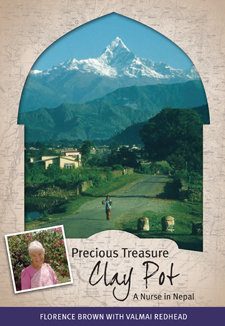 A captivating and honest story of one woman's journey to make a difference in the lives of people in the foothills of the Himalayas. Growing up in rural New Zealand could not be more different from living and working in Nepal but that was no deterrent for Flo. This is an account of not just surviving, but flourishing, with the barest of facilities while rising above challenges that would intimidate many. "The clarity, pace and detail of this autobiography will challenge and grip the attention of a wide audience of readers. Having read it from cover to cover I am very happy to endorse fully this amazing account of Flo's life." Flo, a shy country girl brought up on a Western Southland farm, had no idea that fulfilling her dream to train as a nurse would lead her to Nepal to share her Christian faith. Settling back again into a comparatively affluent society in New Zealand has meant many adjustments. She has even learnt how to use a computer and a cell phone. Now married, with an instant family, Flo lives in Gore. She is involved with her church and community and loves to keep in touch with friends. God has been her strength through many adventures.